It’s been another busy couple of weeks here at 4Leisure Recruitment. Excitement abounds at the major sporting events we’re following. Boo to the World Cup, hurrah for Wimbledon, and on tenterhooks for the Tour De France. Here’s some news items that have caught our beady eyes recently…. Andy Murray teams up with Amelie Mauresmo. The breaking news in the last few weeks was that reigning Wimbledon champion Andy Murray has taken on 34-year old former ladies No 1 Amelie Mauresmo as his coach, and she even got Mummy’s approval! It is hoped that Amelie will encourage Andy to be more creative in his game. It’s certainly worked so far, as Andy cruised through comfortably to the second round earlier this week. We wish him all the best for the tournament and in his new working partnership. For those who think females should be kept from the world of business, there is Entrepreneur Barbie! Maybe she has been modelled on some of our very own staff, but that would be mere conjecture. Whilst it’s a massive benefit to have an immaculately presented team going out to meet your clients, it does cause some problems when your office supplies company don’t stock everything you need in pink! That’s not to say Barbie isn’t immune to criticism. There is the argument that the Entrepreneur Barbie looks more like a corporate executive than someone who is knee-deep in running their own enterprise. http://www.forbes.com/sites/zipfitme/2014/06/23/why-entrepreneur-barbie-missed-the-mark/, and of course, the point-of-view that Barbie, with her unachievable proportions and perfectly coiffed hair, can never truly be a feminist icon or suitable role model. We still love her anyway, and the latest range is at least a step in the right direction. It’s not all about the money, money, money! Impeccable timing! With all the talk about the lack of females getting the top jobs in the leisure sector, Andy Murray goes and appoints a female coach into one of the highest profile positions in tennis. Why would you not want to be an open-air lifeguard with places like these? Whether you prefer the retro-chic of a lido, or are happy to risk it in less-glamorous open-water, outdoor swimming is undergoing a real renaissance. Many old lidos are being put back into service, and facilities created around popular open-water swimming spots to encourage more people to swim. Here’s a few places where you can swim in the lovely British sunshine! 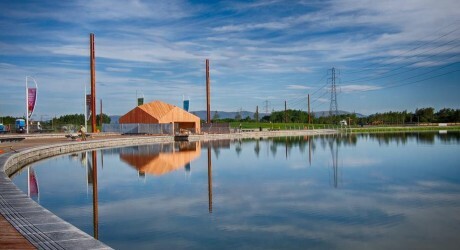 The Helix in Falkirk, Scotland – A brand new lagoon has been opened at The Helix in Falkirk. It looks absolutely beautiful and is sure to be as bracing as Scotland itself. Heron Lake, Middlesex – Heron Lake is one of the largest outdoor swimming lakes in England and is in easy reach of the M25. The lake is open to swimmers of all abilities and sessions start at just £5 but has limited times available so please check out their website. Abbey Meadows Outdoor Pool, Oxfordshire – Open from May to September, Abbey Meadows is open seven days a week and works on a session basis. The pools are suitable for children and lessons are available. The sessions are surprisingly cheap. Askham Outdoor Pool, The Lake District – Due to open sometime in June, the two pools at Askham will be open in afternoons through the summer holiday season. Surrounded by the lush green that the Lake District is famed for, this is bound to be a lovely place to take a dip. The Serpentine Lido, London – One of the most famous park lakes in the world has its own cordoned-off swimming section with beach. Open daily throughout the summer, with a terrace and a children’s play area, this is the perfect way to cool down on a hot London day. Tooting Bec Lido, London – Possibly the most famous open air lido of them all, Tooting Bec Lido has been operating since 1906, and has been used as a film set, and a competition venue, as well as a public pool. Ilkley Lido, Yorkshire – For those hardier Yorkshire folk, the lido at Ilkley has been providing outdoor swimming since 1935. It is also an unusual and interesting mushroom shape. Have you been outdoor swimming? What are your favourite venues?